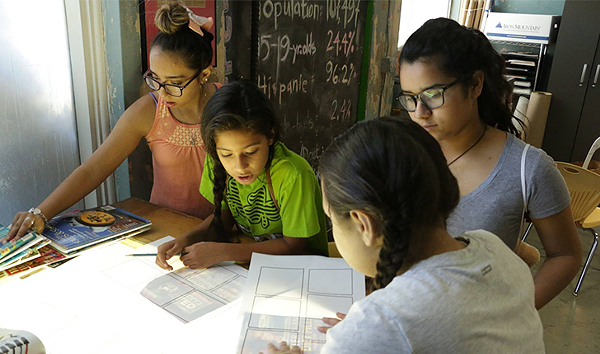 For some youth artists at San Anto Cultural Arts, the first time they’ll be inside of an art gallery will also be the first time they’ll sell a piece of their own artwork. Through the month of July, Presa House Gallery will host “Ojos Hacia El Futuro” or “Eyes to the Future” — a month-long art exhibit that will feature artwork from youths ages 8 through 19. The opening reception is set for July 7 and will feature music from San Anto board member Ernesto Olivo, and the gallery will stay open through July 30 with proceeds benefitting San Anto in the hopes of raising money for its youth and community mural programs. The exhibit is said to be the “brain child” of the Presa House Gallery owner and previous San Anto student, Rigoberto Luna. “It’s important that we make an effort to give back to the organization that built our foundation and appreciation of art, our culture and our community as well as instilling in us the work ethic needed to succeed in all facets of life,” Luna said in a release. 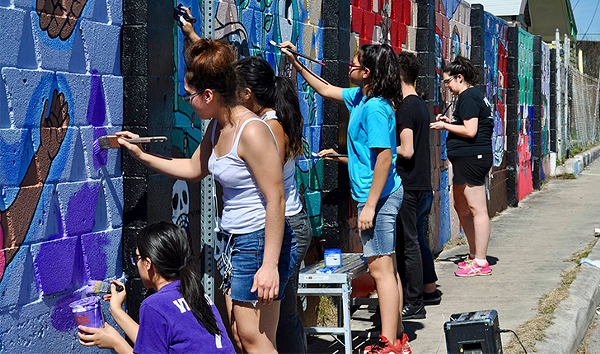 San Anto, a nonprofit organization that focuses on connecting people of all socio-economic backgrounds to art, is best known for its two major bodies of work: community murals and a bimonthly newspaper. The nonprofit also mentors young children who participate in the community projects. We aren’t just an arts organization,” San Anto’s development manager Keli Rosa Cabunoc said. “We are a community arts organization. Rosa says that an important part of being a community arts organization is helping youth feel empowered through art, and she believes the month-long exhibit will help students feel more confident in their skills. Going to an art gallery will not only be a new experience for many of the children but for many of the parents, as well. Rosa says she looks forward to seeing the families react to their children’s art on display. “I’m also excited to see the way the youth will get excited about themselves,” she added. 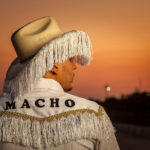 San Anto holds a youth exhibit every year, but never at this magnitude. The exhibit will feature paintings, drawings and photographs. San Anto student Marisol de la Garza, who’s been with the center for nearly three years, says that the youth exhibit will feature many different styles. Her eight pieces at the gallery will have a more realistic style with some surrealism aspects incorporated into it. She said they’ll focus on the connection between people and animals. “I think there’s a little bit of a disconnect happening right now between people and nature,” Garza told the Current. She hopes to tackle this topic through art using paint, acrylic oils and water colors. The willingness to engage with topics concerning environmental justice and social and political issues is one of the main goals for the organization. 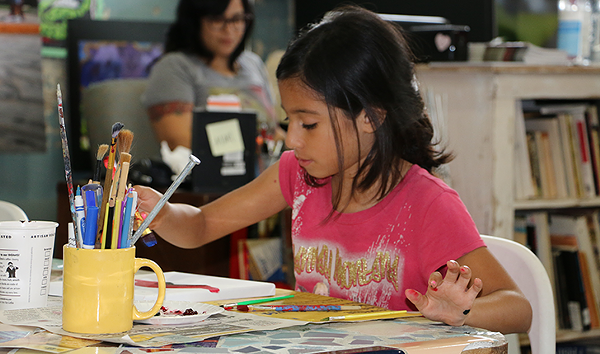 “We teach the children how to use art to become a community leader,” Rosa said. She says that besides the children creating community-minded works, another reason the event is unique is the fact that previous San Anto student Luna is making it possible, adding that it shows that the arts organization, itself, is a community. Students often work alongside more experienced artists, creating long-lasting connections. 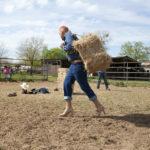 To the leaders of the organization, connections created at the nonprofit are some of the ways that San Anto continues to be successful. When Luna offered to host the student gallery at Presa, it served as a testament to the community bond. That’s something we want to instill into our youth — to come back to the community and reinvest in the youth, Rosa said. Marisol de la Garza echoed the importance of community within the organization. In addition to being a student artist at the facility, she also works as a paid mentor to the younger children. Garza said that by showcasing her San Anto artwork, she thinks she was a more competitive applicant to the University of Southern California, where she was accepted and given a nearly full-ride scholarship. But she says this doesn’t mean that she’s leaving San Anto for good. During her summers back in the city, Garza says that she intends to return to the non profit to continue mentoring the students. But in the meantime, she says that she looks forward to seeing her pieces and the students’ works on display at the Presa art gallery.